Provide comfort for the family of Florence Morgan with a meaningful gesture of sympathy. 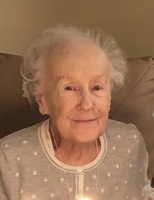 (nee Bassett) Of Menomonee Falls, went home to the Lord on March 7, 2019 at the age of 95. Dear wife of the late Albert J. Morgan Sr. Beloved mother of Albert J. (Cynthia) Morgan Jr. Proud grandmother of Albert J. (Leah) Morgan III. Loving great-grandma of Claire and Nolan. Fond sister of Martha Arndt. Also survived by many nieces and nephews, other relatives and friends. Florence was a member of North Avenue Baptist Church. She retired from Briggs & Stratton after many years of service. Visitation Wednesday, March 13, 5-7 PM at the Schramka Funeral Home, W164 N9034 Water St., Menomonee Falls, with a Funeral Service at 7 PM. Graveside service Thursday, March 14, 11 AM at Pinelawn Memorial Park, 10700 W. Capital Dr. (Please meet inside Pinelawn gate by 10:45 AM). Memorials to the American Cancer Society would be appreciated. To send flowers in memory of Florence G. Morgan, please visit our Heartfelt Sympathies Store. Please meet inside Pinelawn gate by 10:45 AM.